Tie-dye method mistakenly referred to America 60s, but in fact, the history of the art of tie-dyeing begins in the VI century on the banks of India, Japan and Africa. 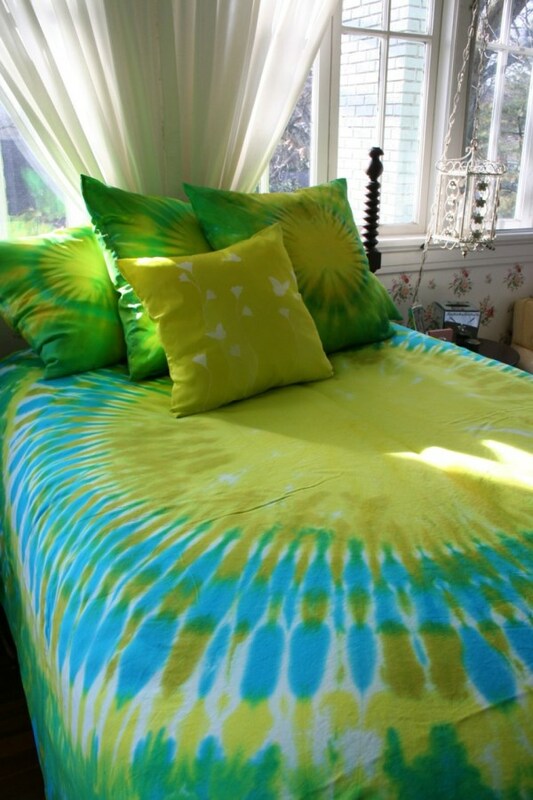 Gradually, bright and simple tie-dye patterns became popular and fashionable worldwide. This is a lovely simple design method that you can use at home. 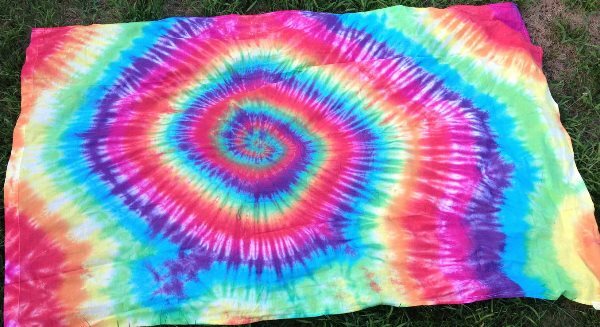 The starting materials for the decoration of bed linen in the style of tie-dye are: cotton fabric for bed linen (or ready white linens), reactive dyes, soda ash, gloves, syringes, rubber bands. The process begins with filling the basin with warm water and soda ash. Do this in gloves so that the skin on the hands was not affected. Presoak linens for 20 minutes after getting the soapy water. While the soda is sinking into the fabric, you can do household chores. After waiting 20 minutes, take out the linens and wring them. In order to get the spirals, find the center of the bed sheet and the duvet cover and gently curl them. Tie the curled bedclothes with thread so that it was convenient to paint and the pattern was not out of shape. The pillow cases will have chaotic blotchiness, therefore we simply turn them into a ball and tie them tightly with bands. Paints for the work: we used Procion MX, but here you can use any reactive dyes which react at room temperature and are fixed with soda ash. There are four basic colors in painting: red, yellow, blue and black. The rest of the spectrum is obtained by mixing. Mix the paint with water: in a glass with the average volume of 250 ml add two teaspoons of dye and stir up until it completely dissolved. Take the syringe and fill it with colored liquid. Paint the twisted linen by sectors from both sides. You can compare the figures obtained with slices of pizza to make it more understandable. It is important to avoid contamination of the center of the fabric while creating the pattern. Otherwise the spiral will be spoiled. After dyeing we need to pack the fabric for a day in the bag or plastic wrap. We do so let the paint not dry up and react with the fibers of the fabric. As a result, we’ve got a bright and very unusual set of bed linen, whose colors will please their owners for a long time. The bedclothes are extremely functional: the paints will not fade and shed over time. I’ve a challenge that I am simply now operating on, and I’ve been at the glance out for such information.